Obviously, in the garage, tools are at the heart of everything. Rarely can anything be done without basic hand tools. 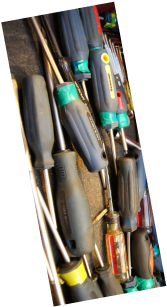 Here is a list of basic tools that should make-up your kit for the maintenance and care of your car. The one on the left is just a simple mallet. You can usually find these at the dollar store and they may just keep a bad situation from getting a whole lot worse. Ever wanted to hit something with a hammer, but knew it'd only break it? Well that's where these plastic champs come in. When you're picking a fight with something metal but you only want to persuade it into cooperating (as opposed to having a fight to the death with an inanimate object) rubber is your friend! So when it comes to those moments when a rubber hammer just won't do, where do we turn? 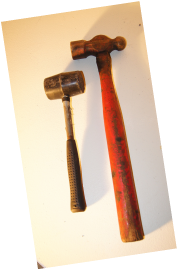 The ball-peen hammer is a great universal tool. It's appropriate place is in the metal-worker's tool box. It has a curved end for shaping and a flat end for flattening. In all honesty though, it's a great tool for when things just need a good whack! They come in a variety of sizes (oh just get the biggest one you can swing!) and they are easy to find. If a ball-peen can't be dug-up, remember that just about any hammer will do. Just be sure to avoid the dollar store when it comes to the metal-on-metal stuff. Cheap forged hammers tend to chip and can shatter. Best to invest a little here. Alankeyes are to be bought at an actual hardware or autoshop store without excuse! Not to sound like a broken record, but "Buying the cheap ones will only result in soft-metal worn keys and worst of all stripped heads (and that means 10X the work getting out what should be a simple screw...no fun at all!)" 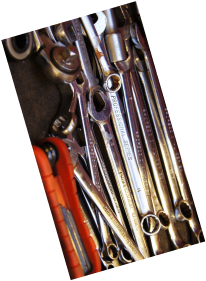 Wrenches are important and are a necessary tool in most jobs. If there's one iconic tool in the garage, it's the wrench. 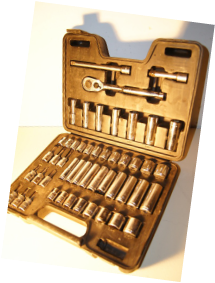 You're gonna want to buy a set of both metric and imperial wrenches if you're making a toolbox, but knowing your car might save you some money here. If you're driving, for example, a Volvo, it's going to be strewn with metric bolts. If, however, you're driving a Dodge, you may be looking for the American standard imperial sizes. Now here is where we're going to drop a little cash, but trust me: It's worth it! 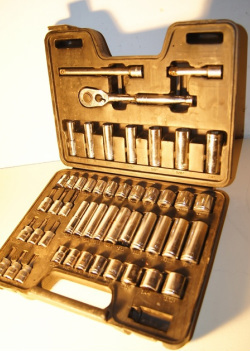 The ratchet set is sort of the ultimate instrument of the automotive world. They come in many shapes, sizes, and even colours...so it's easy to get lost. What you need to know here is this: The cheap ones will make you cry, and you don't need to have a whole chest to get the job done. Sets that cover the 8mm to 19mm range and the 5/16th to 1/2 inch range are the norm. Make sure the kit has a couple extensions for the hard to reach areas, and it never hurts to have one with a couple alankey and screw-bit attachments for those long-threaded, seemingly never-ending screws. This covers the basics on what you should have in your toolbox. Many jobs require specialized tools but these 4 categories will cover you for at least 90% of the work you'll be able to do to your car with just the basic knowledge I have for you on this site. So stock up and be prepared. You can never have too many tools remember; It's better to have them and not need them, than to need them and not have them! Just type the question below and I'll get back to you ASAP!